other alternative than to bring forth data to dispute the wrongful accusations. refuses to communicate with me in a civil and mature fashion to work things out amicably, although I have offered my willingness to work things out with him that would be mutually beneficial for both him and myself, in spite of everything I've been subjected to, not only because of his offending behaviours towards me, but also the resulting offending behaviour of several others towards me. 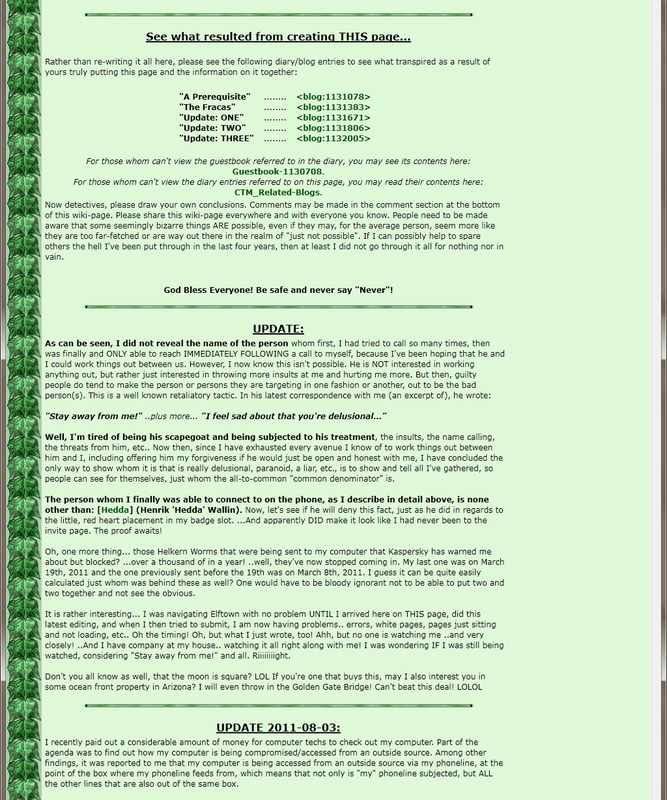 Welcome to "Truth-Time" of the domain www.elftown.org! 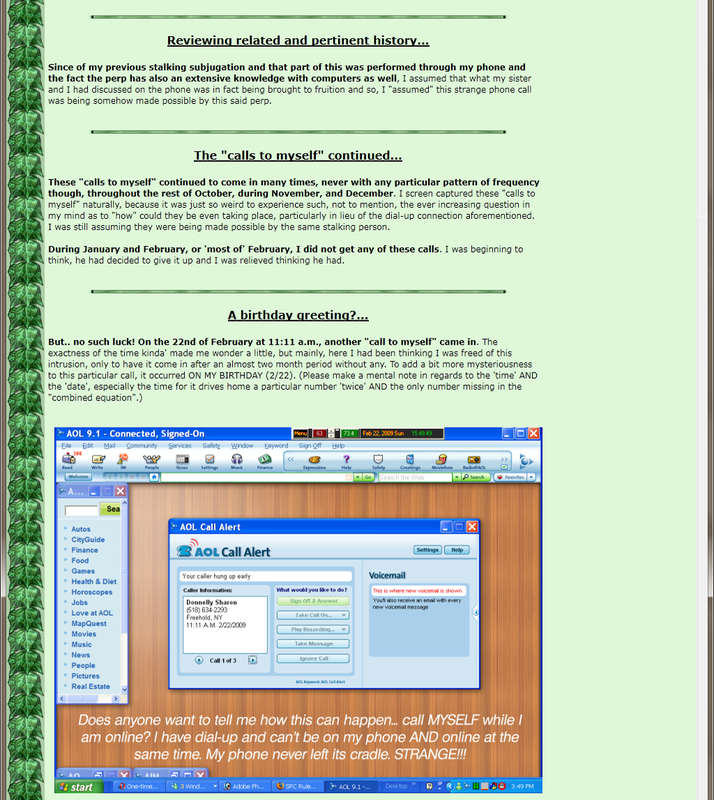 This site was originally purchased by myself to help promote Elftown.com, but it has now become a place to tell some of the truths about the site, its owner, and some of the people on it. 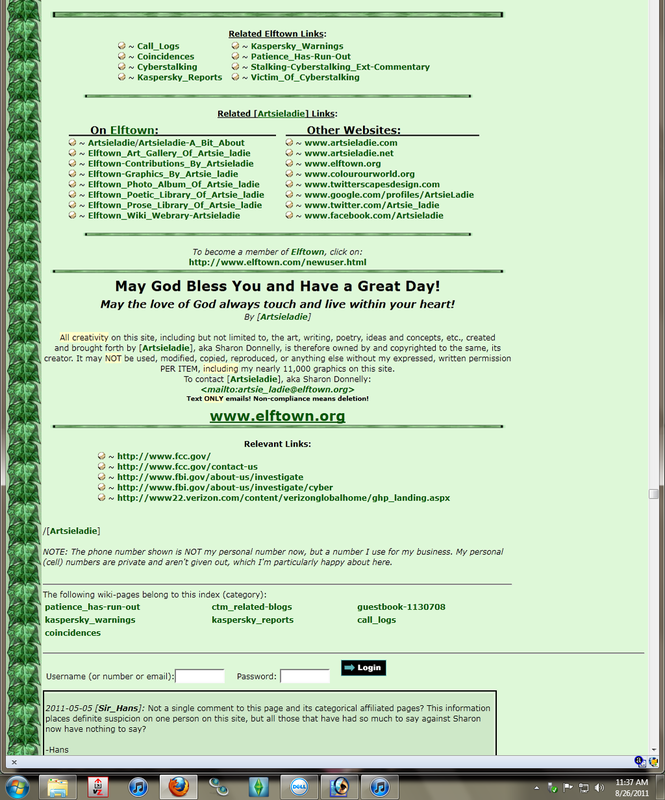 I dedicated years of my time and efforts, as well as donated over $1000.00 in USD to a site called www.elftown.com. One would think such devotion and dedication, especially the magnitude of which I did, would be appreciated. But not only was I and my devotion not appreciated, but I became the subject of having my privacy and my life invaded and then because I tried to first pinpoint it, then once verified through mega amounts of saved and documented material, tried to get help on the site to get it halted, I was then ostracised, humiliated, threatened, and bullied by many members, mostly of the crew/council on the site, both past and present, as well as insulted, berated, etc., by the owner himself, Mr. Henrik Hedda Wallin. 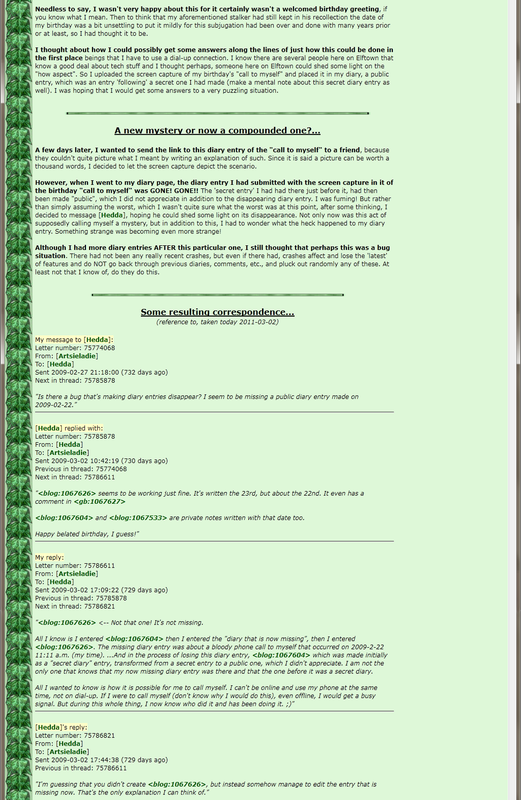 Elftown.com's site owner threatened me that if I insisted on telling my side of the story, such as can be seen below, then he would permanently ban me from his site, which translates into slandering and defiling my name all over the Internet, which is "he" is now doing. All one has to do is Google "Artsieladie" and one can then see for themselves. ...And so, he has all of my work, which he is denying me access to, which is theft of my work, and he's allowing others to use my work "as they wish", even though I have very publicly stated the rules in regards to the usage and sharing of my work. He accuses "me" of lying and spreading conspiracy theories, when in fact, "he" is just trying to force me to shut up about all that I know and all the data I've collected implicating him AND the way I was ostracised on his site. 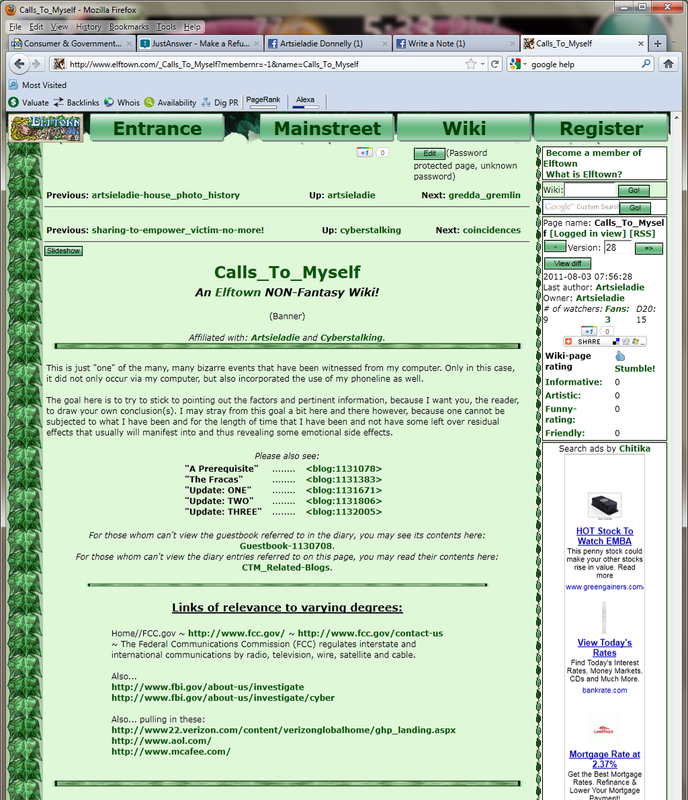 Because the information/data surrounding my telephone and I've dubbed as "Calls_To_Myself" is on a wiki-page on www.elftown.com and titled the same, was deliberately concealed from public viewing by the owner of the site and whom is the one implicated by its content/data, incidentally, I'm opting to reveal what exactly he has chosen to hide from the public's view. I've screengrabbed the wiki-page showing "my" last edit of the page, which was page version 28, as I have also screengrabbed Hedda's last edit of page version 29, which is when he placed a "password for viewability" on the page. I have been subjected to "five plus years" of hell and counting because a person decided that my life was too interesting to resist, I guess. ..And then all the degradation and character assassination I've received on top of having my privacy invaded besides, spurned on by jealousy, just makes all I've been forced to have to go through whether I liked it or not, is "off the chart"! I just want others to know that it IS very possible to become the object of someone's OBSESSIVENESS over the Internet AND that it CAN become VERY INTRUSIVE of your life. ...And since Mr. Henrik Hedda Wallin has chosen to slander my name all over the Internet, then this leaves me with no other recourse than to defend myself and my name and I will do so with data I've collected, which will show just "who" is spreading lies. The link to this now "concealed" wiki-page: http://www.elftown.com/_Calls_To_Myself. 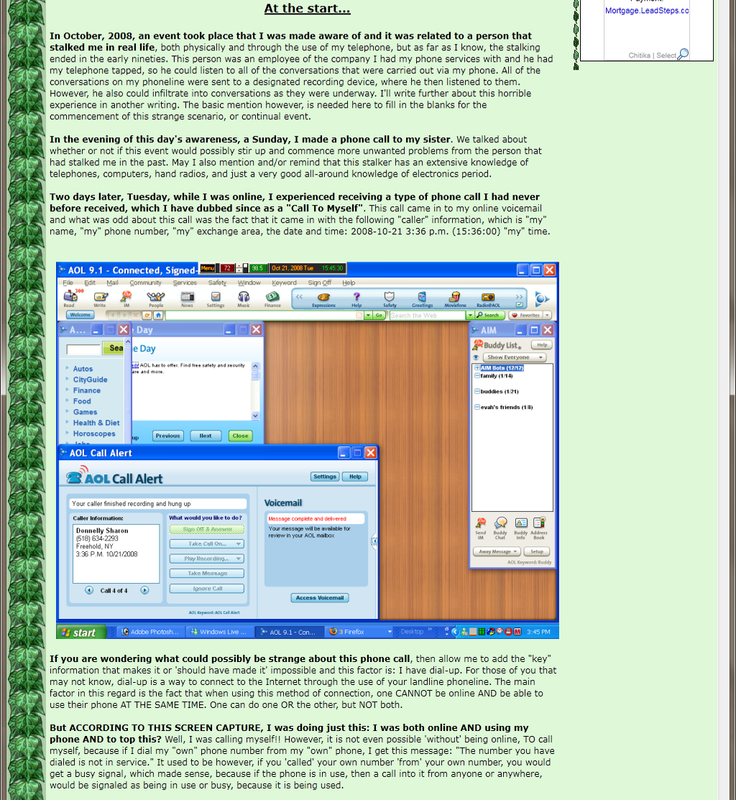 Now the screengrab of, which is in sections because the entire full screengrab is too large. So, if Henrik is denying the call transpired between him and I, the proof is in the pudding.. or rather.. my 'bill' I received from Verizon. ...as I planned and so stated. Now lookie here! 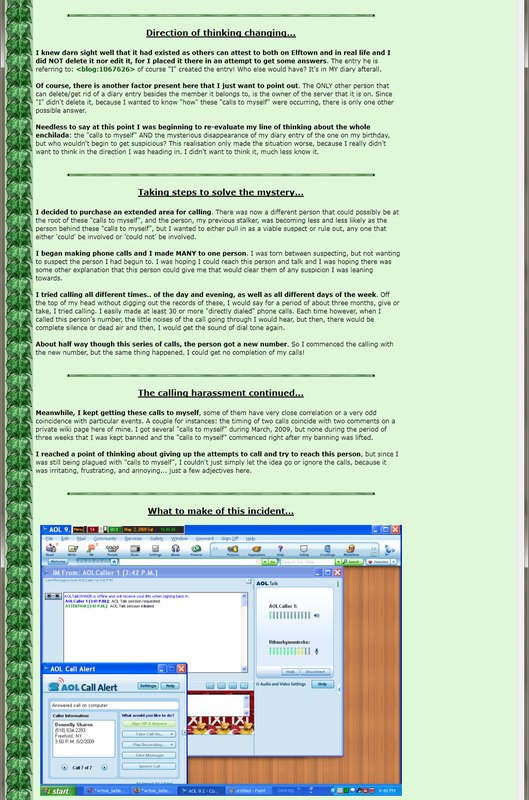 Here is a screengrab of Henrik Hedda Wallin's site: www.heddate.com taken on 2011-09-01. 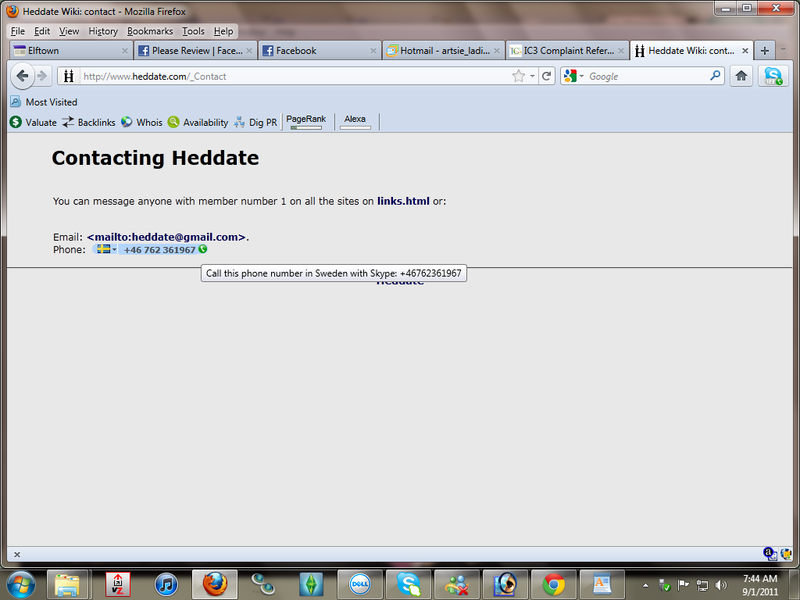 This is his "Contact Heddate" page and Hedda does own Heddate. Please note "his contact phone number". It is the same as is on my Verizon bill: "46762361967". So, what can Hedda dispute so far? Not much, can he? 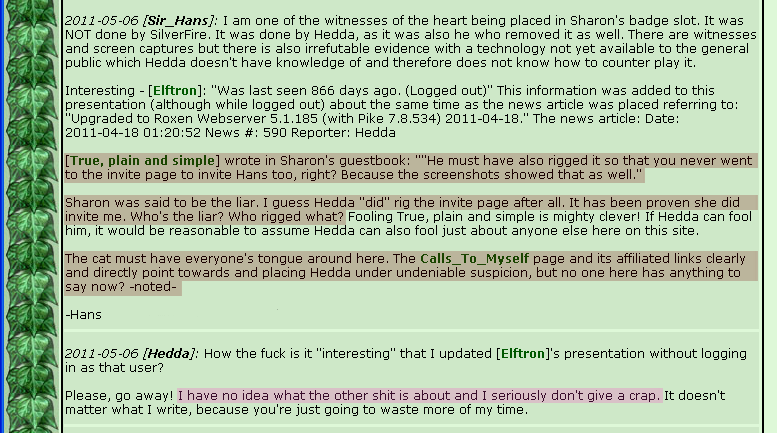 But yet, Hedda said that he didn't know what Hans was talking about, when Hans asked on another wiki-page of mine: http://www.elftown.com/_For%20The%20L♥ve%20Of%20A%20Community%20-%20Elftown! Gee, it's appearing thus far, that Hedda is, shall I say, "not telling the truth"? Please note on the bottom left hand side of this screen capture, it says: "This is an empty page." Which means I had not yet submitted even the "very first" page version at this time. Please keep this in mind, because I'm also going to show MANY "seemingly" coincidences involving Helkern Worm warnings. I received more than 1000 in a year! 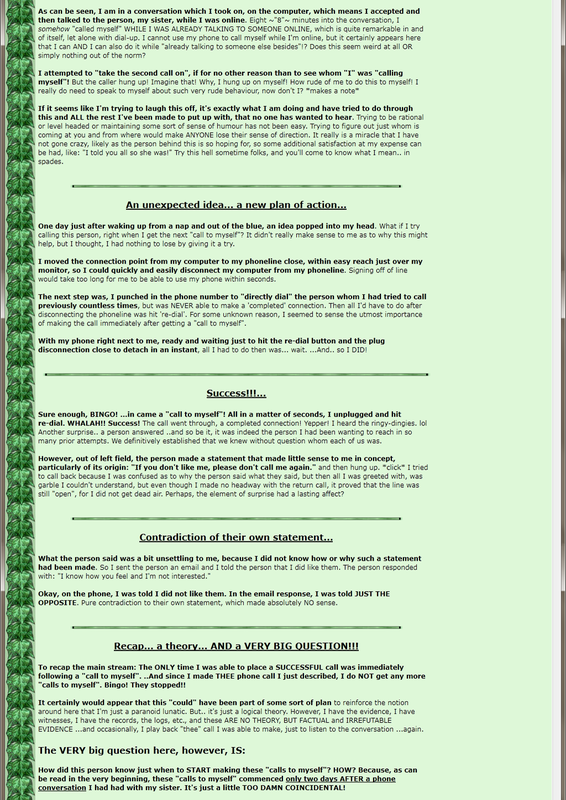 Please watch for LOTS more data and information, which I WILL be posting that will show and tell that I am not imaging things, nor am I paranoid, as Hedda and several members on www.elftown.com have tried to drive home to everyone I am, because the evidence of the TRUTH does.. not.. lie. If one shows proof of that which supports their reasoning, this is not spreading lies nor is it just "conspiracy theories". On the other hand if someone that claims another is telling lies or spreading rumors, but "they themselves" are shown to be lying, this only proves the pot is trying to call the kettle black to divert others from questioning their own immoral, unethical behaviour. Deliberately diverting unwanted attention away from oneself, because one doesn't want their own integrity and/or agendas to be questioned, is a very commonplace tactic used by one who is guilty of wrongdoing. Please stay tuned for more data to be presented with additional pages, which will appear in the sidebar column, as they are created. Please comment and give your feedback in my guestbook. Thank you!